The Party season has well and truly started here in TheMadHouse. Things hot up for us from Halloween. We have parties and birthdays galore into the new year and tonight is no exception. My wonderful neice is getting engaged to her man tonight at "The Club" and we are all off for a little bit of dancing and socialising with our family. Now I have blogged about "The Club" before and we are really lucky that my Brother and Sister in Law are mangers and run it and it makes for a great venue and is such a brilliant place ad they do such a great job. Not only is it a sports and social club, but they run a youth group too on a Tuesday night for 8 to 15 year olds (only 20p), a football team, there is a bowling club, Saturday live entertainment, bingo, live football and sport, oh I could go on and on. it is a real part of the community. The thing is the Club is in a deprived part of town in the North East of England and people are not flush by any means, but it works because it not trying to be anything other than what it is a real place for anyone, with some for everyone. SIL throws a mean party, she has plenty of experiance and just seems to get it right, put her secret is that there is lots of effort in the planning and also she is a real extrovert who joins in and makes sure everyone gets involved. We are so looking forward to the Children's Disco on December 8th, A live Panto on 23rd December and the Children Boxing Day Extravaganza, which is on the 28th this year!! There is no way I couldn't compete with the parties that she puts on so I dont try and that is my secret, she does it best, so I sit back and enjoy them helping out where I can. 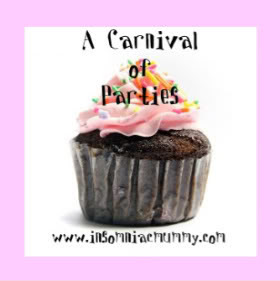 But if you are looking for some inspiration for parties then Insomniac Mummy is holding a Carnival of Parties, so pop on your party frock and boogie on over and take a look and enjoy this party season.